This Is Spinal Tap (officially spelled This Is Spın̈al Tap, with a non-functional umlaut over the letter n — n-diaeresis — and a dotless letter i) is an American 1984 rock musical mockumentary directed by Rob Reiner about the fictional heavy metal band Spinal Tap. The film satirizes the wild personal behavior and musical pretensions of hard rock and heavy metal musical bands, as well as the hagiographic tendencies of rock documentaries of the time. 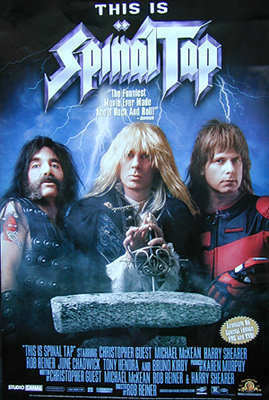 The three core members of Spinal Tap—David St. Hubbins, Derek Smalls and Nigel Tufnel—are played by the American actors Michael McKean and Harry Shearer, and English-American actor Christopher Guest, respectively. The three actors play their musical instruments and speak with mock English accents throughout the film. Reiner appears as Marty DiBergi, the maker of the documentary. Other actors in the film are Tony Hendra as the group manager Ian Faith and June Chadwick as St. Hubbins' interfering girlfriend Jeanine. Actors Paul Shaffer, Fred Willard, Fran Drescher, Bruno Kirby, Howard Hesseman, Ed Begley, Jr., Patrick Macnee, Anjelica Huston, Vicki Blue, Dana Carvey and Billy Crystal all play supporting roles or make cameo appearances in the film. Scream queen starlets Brinke Stevens and Linnea Quigley appear in cameos as groupies of the band. In 2002, This Is Spinal Tap was deemed "culturally, historically, or aesthetically significant" by the Library of Congress and was selected for preservation in the United States National Film Registry.